JERUSALEM – “In accordance with rules of hospitality and dignity,” Israel will not prevent Pope Benedict XVI from wearing his pectoral cross when he visits the Western Wall, the Israeli Foreign Ministry said. Responding to what it called a “misleading quotation” in The Jerusalem Post, the ministry released a statement by Ambassador Mordechay Lewy from the Israeli Embassy to the Holy See March 17. During his 2000 pilgrimage Pope John Paul II visited the site with his cross visible. “I feel the same way about a Jew putting on a tallit and phylacteries (Jewish prayer shawl and prayer box) and going into a church,” the rabbi was quoted as saying. 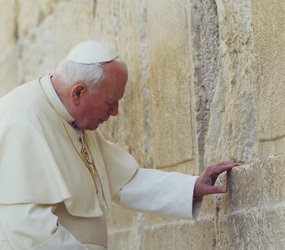 JTA, an international Jewish news agency, reported the rabbi has refused to allow other Catholic leaders to visit the Western Wall after they declined to remove or hide their crosses.